The overall project goal is the optimization of health management on board of container and merchant vessels. 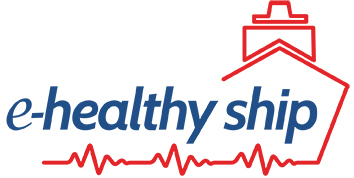 e-healthy ship is an interdisciplinary, EU-funded project to improve health management on vessels without doctors on board. In the maritime industry, occupational safety and health prevention on board merchant ships are becoming increasingly important. The progressive digitization of processes on board and the transmission of real-time information ("Maritime 4.0") are also changing the maritime economy in many facets. In the future, it will be possible to transmit more and more health-related aspects ashore in real time. This is where the interdisciplinary joint project "e-healthy ship" comes in. facilitate the implementation of health and safety regulations. By developing and using innovative IT technology, the networking of established maritime information systems will be tested, scientifically evaluated, improved and further developed. All elements serve the health, well-being and empowerment of the seafarers as well as the protection of personnel resources on vessels of shipping companies operating in the German city of Hamburg. Based on the findings, an interdisciplinary concept for e-health management and for further suitable interventions will be designed. The project partners are developing an e-health platform to support and relieve nautical officers in the medical care of crew members. The platform is to be connected to established maritime IT systems and be available on various devices. It will consist of various thematic modules (e.g. medicine chest, telemedicine, medical record, e-learning). The project has a total volume of EUR 1,860,617. It is funded by the European Union (European Regional Development Fund) and the Free Hanseatic City of Hamburg (Ministry of Health and Consumer Protection). The project partners also contribute capital of their own.